As the cluster of St. Mary’s University students disembarked the plane in southern India, they were struck first by the differences: the bare feet of the Marianist brother who greeted them at the airport in the middle of the night, the wild traffic maneuvers already underway long before dawn, the heady scent of jasmine, spices, distant smoke and the sour tinge of refuse. But, in the days to come, the students discovered it wasn’t the contrasts that would affect their lives most. It was the striking similarities that span humanity — a welcoming smile, an offer of food, a shared focus on education, a desire to succeed in career and life. St. Mary’s University student Gisell Orozco reads a book with a group of children on the streets of Bangalore’s slums. These potent parallels forged a bond between 10 St. Mary’s students — led by Greehey School of Business faculty and the school’s chaplain, the Rev. Jim Tobin, S.M. — and the underprivileged youths to whom they mentored and taught business skills in the frenetic metropolis of Bengaluru, commonly called Bangalore. With the assistance of the Marianist brothers in India and the efforts of other organizations there, the St. Mary’s students provided business workshops to about 70 high school dropouts between the ages of 18 and 30. The group also visited play schools, essentially a preschool for children living in the dilapidated, multicolored buildings of the city’s slums. The St. Mary’s students, each members of the entrepreneurship-focused student organization Enactus, had big plans to make a difference but discovered they really “went in blind” to what they would find, said Celeste Padron (B.B.A. ’16), who graduated in May. Padron and fellow student José Parrilla said they gained a newfound appreciation not only for their lives back home, but also for their educational advantages as part of a Marianist university. Propelling this growth in the students’ frame of mind was the intended objective for trip organizers Tobin and Finance Professor Prasad Padmanabhan, Ph.D.
St. Mary’s University undergraduates make friends with students from GMR’s skills training programs. “I am a true believer that experiences such as these help our students better understand not merely the problems facing the world, but also be active participants in developing solutions that work,” she said. Traipsing along dusty back streets and sidestepping piles of putrid street garbage in slums, St. Mary’s students visited people receiving assistance from the Marianists through their Ragpickers Education & Development Scheme, or REDS, named for the youths who pluck cloth and plastic from garbage mounds to sell as recyclables. REDS outreach in Bangalore includes more than a dozen play schools providing early childhood education to about 500 children, along with tailoring classes for women and other programs. The St. Mary’s students also visited the nearby community of Deepahalli, where Marianists operate a residential center and encourage about 35 energetic boys from impoverished and neglectful upbringings with limited education to either attend a formal school or learn carpentry, welding, tailoring, plumbing or electrical work. Though the REDS program was initiated in the late 1970s, a more recent affiliation has made additional skills-training assistance possible in Bangalore’s slums for young adults who have dropped out of high school. Six years ago, the GMR Varalakshmi Foundation began renting space on the Marianist campus in Bangalore and offering free training in tailoring, air conditioning and refrigeration, electrical work, computer and software skills, along with subsequent job placement. The foundation is the corporate responsibility wing of the multinational infrastructure company GMR Group, and the rent it pays to be on the Marianist campus helps fund the REDS programs, said Brother A. Arokiadoss, S.M., REDS executive director. GMR also partners with other well-regarded corporations, such as Schneider Electric for the electrical training program and Voltas for air conditioning training, to develop curriculum and create job opportunities for graduates, said Jayapaul (his complete name), program officer for the foundation. The nascent mentorship program with St. Mary’s, through which students exchanged a few emails before meeting in person, helped raise the confidence level of the GMR students, Jayapaul said. These benefits may be worth expanding the collaboration to other centers in New Delhi or Hyderabad, he said. 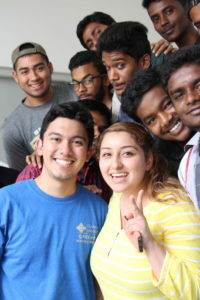 Faiz Ali, one of the students in GMR’s air conditioning and refrigeration course, said he found value in the students’ visit — especially in the emotional intelligence workshop, which discussed how to channel their emotions and treat others. The sense of global community connected by the Marianist spirit persisted as the students returned to San Antonio and left behind their experiences of washing clothes by hand on a stone, bathing with a bucket, and dealing with intermittent power outages in the stifling heat. Children in the Marianist schools in Bangalore’s slums say goodbye to visiting St. Mary’s students. The service completed and the connections built with the GMR students and the Marianist brothers in Bangalore elevated each St. Mary’s student “from being just an observer, to actually being a member of that community,” said Stephanie Ward, Ph.D., Assistant Professor of Human Resources and one of the faculty leaders on the trip. Parrilla, an Information Systems Management major, built upon that sentiment. Undertaking an immersion experience of this depth and magnitude with college students who may be on their first trip abroad was logistically challenging and only possible with the financial support of the business school, said faculty and student leaders. “You’ll be rewarded when you look into the students’ eyes, and you’ll be rewarded by their confidence,” said Padmanabhan, reflecting on the newfound assurance he has already seen the Enactus students exhibit.